Distance from the Liberty Stadium: 274 miles ~ 4 hours 55 minutes. 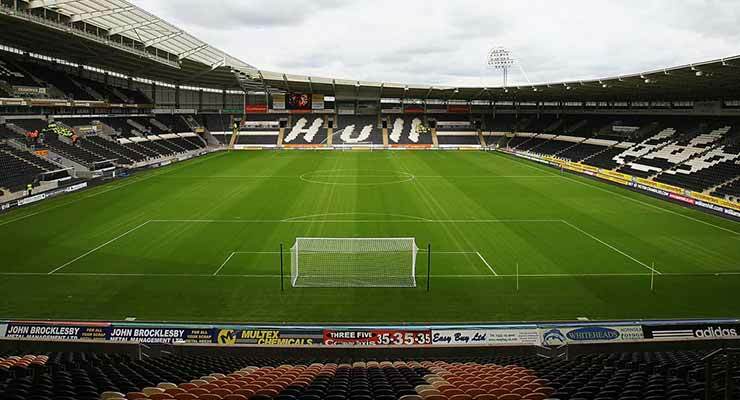 Hull City v Swansea City tickets are still available to buy online or at the Swans ticket office in advance. Alternatively, you can now pay on the day at the KCOM Stadium if you wish. Away fans are tucked away in the North East corner, the facilities available are good, plus there’s a cracking view of the game, although you are set back from the pitch. On the concourse alcohol is available and a really good selection of food. For such a long trek to Hull it’s worth spending more just the day in the area. Hull has cracking nightlife which is really busy on weekends. Along with the regular hotel chains that run Express by Holiday Inn, Holiday Inn Hull Marina, Ibis Hull Hotel and Mercure Royal Hotel there are independent hotels and many cheap B&B places in the Spring Bank area of the city. The Comedy Lounge (HU1 2AA) has stand up night on the Friday with tickets at £13.20. There’s night of comedy on the Saturday at LOL Comedy Club, Mortimer Suite at Hull City Hall (HU1 3RQ), tickets are from £16. The Sweet are at The Welly (HU3 1TS) on the night of the game, tickets are £22. Bernie Clifton and Anita Dobson are in Cinderella at Hull New Theatre (HU1 3HF) throughout the whole of December, tickets are from £14.50. The Friday it’s Carols by Candlelight, at Hull City Hall (HU1 3RQ), tickets are from £23. The night of the game, Boney M & Odyssey are there, tickets are from £31.50. Sunday, it’s The Searchers Christmas Show with tickets from £28. Hull has a number of museums as well as exhibitions on during the weekend of our game. It has plenty of country parks and open countryside for those wanting to blow away the cobwebs. Away fans have their own bar at the stadium; The Pitch Side near the away entrance. Cold food and snacks are sold. Alcohol is served until 45 minutes before KO. The Park View (HU3 6JB) is opposite the stadium car park; is quite friendly, showing Sky Sports with a burger van outside. 0.6 miles away is The New Walton Club (HU3 6JR) and costs £1 to get in. It has cheap beer, is a decent size and does match-day food like burgers and chips. Turn right out of the main car park entrance and it’s down the road on the left-hand side. Further down Walton Street, on the corner with Anlaby Road, is The Boot Room (HU3 6NS); its 0.4 miles from the stadium. There are many pubs within a few minutes’ walk, but these are home fans only. Most Hull fans still go to pubs around Boothferry Park. These should be avoided by Swans fans, The Silver Cod a no-go pub for away fans is closed. You can head to the nearby city centre, with plenty of pubs. I’ve been to Bowery (HU5 3QA) loads of times. It’s a big pub with many TVs showing Sky & BT Sports. It’s a 15-minute (0.4 mile) walk from the stadium, going across the pedestrian footbridge over the railway line. Princes Avenue has many pubs, Pave (HU5 3QA) is 0.4 miles away, with a large selection of beers from around the world and decent food. They often have evening jazz performers. There’s parking in the streets off the avenue. Around a 15-minute walk up Walton Street, The Avenue pub (HU5 3TS), a Sizzling pub is a mile away. If walking to the stadium from the city centre, The Punch Hotel (HU1 3RB) is next to the Princes Quay shopping centre, near the train station and does great home-made food and is 1.6 miles from the stadium. Right by is The Admiral of the Humber, (HU1 2NR) a Wetherspoons pub. The stadium has a huge car park (£5); if you get there early and want to go into the city centre, there’s a park and ride bus back and forth. It can take 30 minute to get out if you park a long way from the exits. There are two exits from the car park onto Walton Street. You exit quickest from the right-hand exit. There’s a Park & Ride signposted off the A63 (shared with home fans). Parking at The Hull Royal Infirmary (HU3 2JZ); is £5 for 4 hours and a 15-minute walk to the ground, although many fans park in the town centre car parks and walk to the stadium. You can also choose from a selection of private car parking spaces near the KCOM Stadium – including around 10 reservable parking spaces from just £3.00 for the day. The stadium is a 20-minute, 1.5 mile walk from Hull station. Turn left at the end of the platform and then left into the bus station. Walk past Tesco on your right, cross over Park Street at the traffic lights. Following blue pedestrian signs to KCOM Stadium passing a chip shop. Cross Argyle Street and onto pedestrian walkway and bridges over railway lines to stadium. For away end turn right at the bottom of steps. Trains leave Swansea at 08:54, 09:29, 09:33 and 09:54 getting there at 15:45, 16:14, 16:14 and 16:45. No trains get back to Swansea after the game – meaning you’d have to stay overnight!